Wedding gifts are notoriously difficult to buy. You either receive a list to a set of over priced pots and pans and you are left scrambling around to buy the cheapest item on the list which depending how quick off the mark you are might be a toast rack at the same price as a small family car. Alternatively you could be given the dilemma that you the choice is entirely up to you. Knowing that the couple have been together for an extensive amount of time you also know that they have everything they need for their new life together. So what is the answer? Look no further, a box of craft ale is the perfect gift as a congratulations. What better way to celebrate this life changing journey than with a selection of the worlds best beers. The perfect way to celebrate the joining of two people in matrimony. It has often been said that people will forget what you said, they will forget what you did, but they never forget how you made them feel. Why not make them feel great with a selection of the most prestigious premium Craft ales. So the loved up couple have been on honeymoon and are set to imminently return from the best holiday of their lifetime. You are making sure milk, eggs and bread are in the fridge for their return. 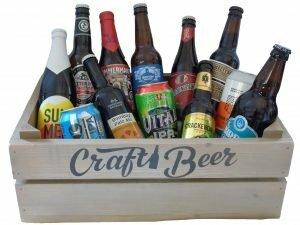 Why not place a case of Crafti Beer in the fridge for them as well as a welcome home gift. That feeling when they open the fridge and see that someone has though about what they are going to want to drink on their return from their special trip or big day. Place an order today and make that special couple feel really special with a crate of craft lager. You will be the person that will be remembered for buying a special unusual gift. If you don’t want to order the beer today, how about sending them a Gift Voucher instead. That way they can order the beer when ever is convenient for them. Order today and make someone very happy on their most important day.